I’ve heard people say in the past, how certain things in astronomy (like planet hunting) can be like looking for a needle in a haystack, but this is taking that metaphor quite literally. 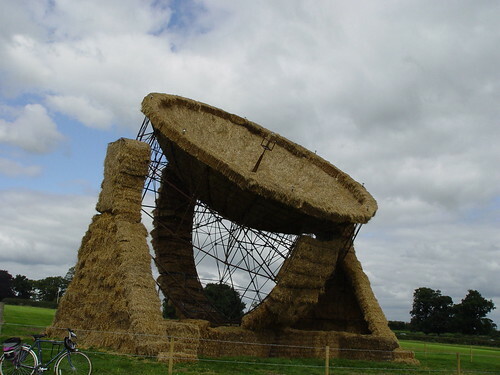 In my random meanderings on the internet I found this scale replica of Jodrell Bank’s Lovell Telescope made from hay bales. And rather impressive it is too! The creator of this fantastic little sculpture is Park Farm in Cheshire. Makers of the mouthwatering Snugbury’s Ice Cream and accomplished straw sculptors. This entry was posted in art, Imported from Livejournal and tagged art, culture, telescopes. Bookmark the permalink.